PORTLAND, Ore. -- Jaelene Hinkle revealed she decided not to play for the U.S. women's national team last year because her Christian faith prevented her from wearing a jersey that commemorated LGBTQ Pride Month. Hinkle revealed the reason for her decision in an interview posted Wednesday on The 700 Club. No formal reason for her absence was given by the national team at the time. "I just felt so convicted in my spirit that it wasn't my job to wear this jersey," Hinkle said. "I gave myself three days to just seek and pray and determine what he was asking me to do in this situation... I knew in my spirit I was doing the right thing. I knew I was being obedient." Since turning down the call-up last June, Hinkle has not been called up to the national team, which has featured a number of openly gay players. 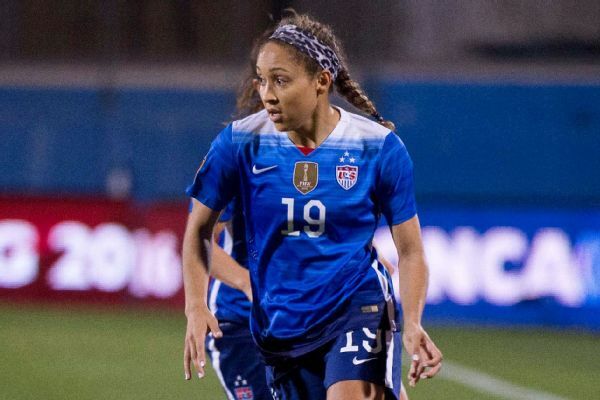 Jaelene Hinkle has made eight appearances for the U.S. women's soccer team. A defender, Hinkle plays for the North Carolina Courage of the National Women's Soccer League. The Courage visited the Portland Thorns on Wednesday night, and there were boos heard when she was announced in the starting lineup. Some waved rainbow Pride flags. Hinkle did not comment after the match but received the backing of her teammate Jessica McDonald. "She is high on her faith, and in my honest option that's absolutely incredible,'' McDonald said. "If she's for God, then that's fine, that's great if that's what keeps her going in her life and keeps positivity in her life, then let that be. Everyone has their opinions about The Bible and God. It's obviously not in my control what she thinks. McDonald added: "At the end of the day, I'm still going to be friends with her. We have no problems with each other. She's never said anything bad about me. She never said anything bad about anybody. So, for people to pass on that kind of judgement on another human being, I think it's sort of uncalled for. She's got her opinions. That's fine. Everybody does. It hasn't affected our team at all." Courage coach Paul Riley said he heard the boos and echoed McDonald's sentiment. The Courage, who rank atop the NWSL standings, beat the Thorns 4-1.